During the week of April 1st, the majority of steelhead angler effort on the upper Salmon River was located either near the Pahsimeroi River confluence or upstream of the East Fork Salmon River in location code 19. 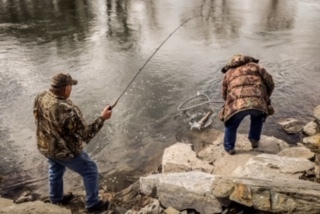 Angler effort downstream of Salmon, ID was minimal and no angler interviews were obtained. Anglers interviewed downstream of the Pahsimeroi River confluence in location code 17 averaged 24 hours per steelhead caught. Anglers interviewed near Challis, ID in location code 18 averaged 42 hours per steelhead caught, and anglers interviewed upstream of the East Fork in location code 19 averaged 6 hours per steelhead caught. The Salmon River remained in good condition throughout the week. On Sunday, the river was clear upstream of the Pahsimeroi River and cloudy downstream. River temperatures also remained stable and were in the mid to upper 40s. Currently the Salmon River is flowing at 1,370 cfs through the town of Salmon, ID which is 99% of average for today’s date. As of Friday, April 5th the Pahsimeroi Hatchery has trapped 1,068 hatchery steelhead and as of Thursday, April 4th the Sawtooth Hatchery has trapped 288 hatchery steelhead.